The Old Sawmill Glenborrodale. 3 Bed Private Detached Stone Cottage with Logburner,Beautifully furnished with quality and comfort . Secure stunning Private gardens with babbling burn running through.Fantastic position adjacent to Glenborrodale Bay Ardnamurchan. Described by our guests as the most comfortable, well equipped , peaceful holiday cottage they have stayed in. Welcome to our Holiday Home, we would love you to come and stay in our beautiful cottage. If you love the natural world , wildlife , peace and quiet all set in stunning private garden grounds where a Pine Marten family, Birds, Bees, Frogs & Lizards and bats all live, then come here you won't be disappointed, it is just 'Heaven on Earth' as our guests describe it ! Set in Private secure gardens with fabulous views and walks straight from the door, our cottage has 3 Bedrooms 2 x Double & 1 Twin bed all with new Beds.Open plan living/Kitchen/Dinning (Oven/hob/fridge/microwave/toaster)for 6 people with character Logburning Stove as focal point with SKY TV/WiFi/Phone .Utility room with cloaks, large washing machine, Drier,Freezer & Dishwasher.Bathroom with Bath, Wc and WHB . Further separate WC and WHB. All bedding, towels included. Beds made up for your arrival.We provide everything you may need like toilet rolls, kitchen roll, foil, cling film,washing up liquid, clothes detergents for washer and dishwasher , cool box , thermos flask for picnics etc, etc. .Fabulous stunning private gardens with unfenced babbling burn.Lawn, Shrubs and fruit trees, bird feeders and plenty of seating & Barbeque.Private Parking for several Cars.Cyclists, fishermen & women and canoeists all welcome with secure building for storage of bikes and canoes/ kayaks which can be launched adjacently in the bay on Loch Sunart. Ideal for children though care needed with supervision of toddlers near open burn.Fishing nets provided for the wee ones ! Bring your wellies or wetsuits ! 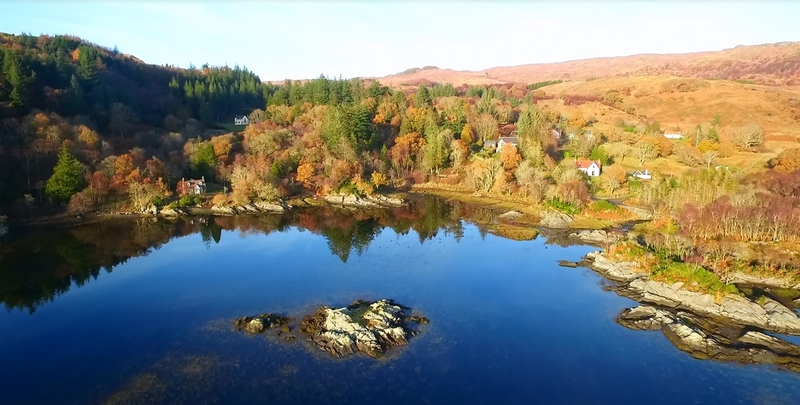 Set in an area of outstanding natural beauty Ardnamurchan - almost an Island, it is a remote area of the west Highlands known for its natural beauty, peace & quiet and spiritual uplifting.Ideal for those seeking some rest and recharge ! Children can enjoy running around paddling & fishing for small trout in the burn ! Amazing wildlife abounds with numerous birds visiting the garden. 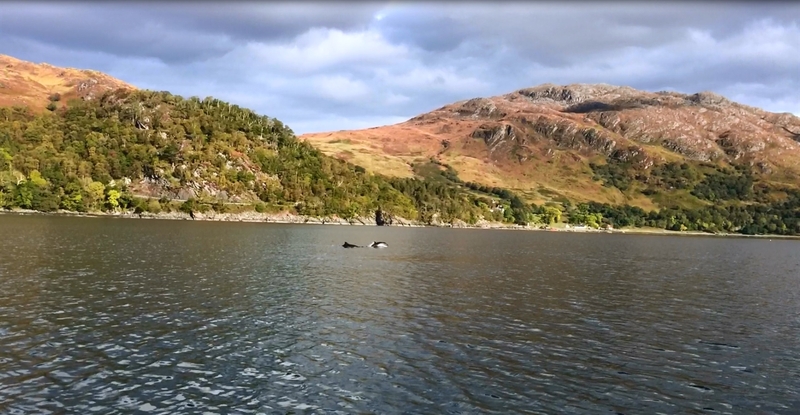 Pine Marten,Lizards, Red Deer, Roe Deer, Fallow deer,Golden Eagles, Sea Eagles, Otters, Dolphins and occasionally Wild Cats are frequently seen in this area, as can many plant and wildflower species.Binoculars and plenty of bird/wildlife/wildflower literature and books in the cottage.Location maps with best places to visit and loads of info on area. Beautiful white sandy beaches with clear blue clean waters are situated around the penninsula where one can while away an hour or two, enjoy a good walk, have a picnic or just a paddle! Our cottage is situated in Glenborrodale Bay where you can walk straight from the door out onto the hills or around the coastline.Also locally we have the Adelphi Distillery and the Natural History Visitor Centre so plenty to do if you feel like it.Day trips to Mull , quite cheap now from Kilchoan and boat hire available locally with sea life and whale watching trips.Ardnamurchan Lighthouse is the most westerly point on the british mainland and well worth a visit.Plenty of cafes and coffee shops around too.Winter Skiing is available on Ben Nevis and also Glencoe , both within driving distance. Please feel free to contact me for further information or just a chat about our facilities.